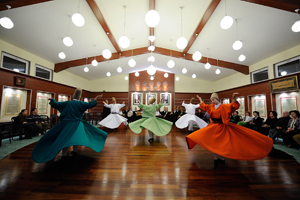 Idea : During this Monastery visit & Dervish Ceremony; you will see the story of Sufism, Sufis and their communities in Istanbul, Turkey, today.You will meet the Sufi community and their monastery, listen to their music, eye-witness the Whirling Dervishes Ceremony. The ceremonies are presented every mondays & thursdays. Meeting time is 20:00 in our Travel Agency and Art Gallerylocated in Sultanahmet ! ** Also we are taking limited number of guests to the monastery in order not to disturb the ambiance soo please send us an E-mail in advanced. 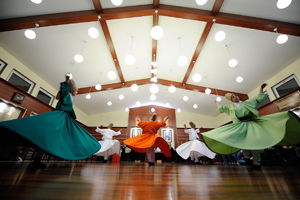 Before the ceremony we can giive you a brief information about the Sufism & the Whirling Dervishes. If you are interested please send us a E-mail for reservation. 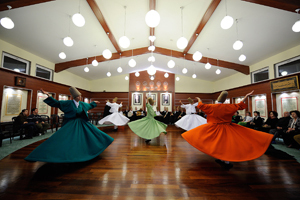 Alternatively we also arrange weekly tours to Konya in Mevlana Week in every december. For information concerning the Mevlena Week in Konya, please send us an E-mail. 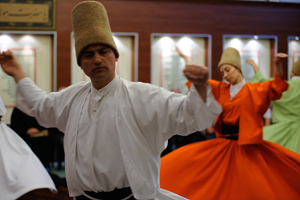 Before the ceremony we can give you a brief information about the Sufism & the Whirling Dervishes. If you are interested please send us an E-mail. for reservation. 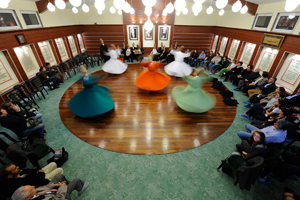 Idea : This tour gives the story of Sufism,Sufis and their communities in Istanbul, Turkey, today.You will meet the Sufi community and their monastery.You will listen to their music.You will eye-witness the Whirling Dervishes Ceremony. This ceremony is presented every week. Alternatively we also arrange weekly tours to Konya in Mevlana Week in every December. For information concerning the Mevlana Week in Konya, please send us an E-mail. Ceremony is every monday & thursday . Discount rates for children and groups. For Sufi Culture Tour, please send us an E-mail. Mevlana was born in 1207 in Balkh (in present day Afghanistan). Mevlana's father, Bahaddin Veled, left his homeland to escape the persecution of the Moguls. He first went with his family to Mecca and Medina and then to Asia Minor, seeking protection and asylum. Finally the family arrived in Konya in 1228 at the invitation of the Seljuk Sultan Alaeddin Keykubat. Bahaddin Veled, known as the “chief of all the learned” in Konya, became highly respected among the Seljuks. When he died in 1231, his son Mevlana was 24 years old. After Bahaddin's death, his followers and students began to gather around Mevlana. They regarded him as the sole intellectual and spiritual heir, and a source of inspiration. In the following years, Mevlana became a teacher in the schools of Konya. As a scholar and theologian, he became even more popular than his father. 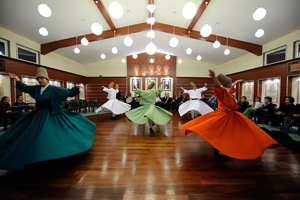 Whirling Dervish Ceremony in Silivrikapi Monestry from Hakan HACIBEKIROGLU on Vimeo. VID-20120719-00034 from Hakan HACIBEKIROGLU on Vimeo.